TYSON FURY needs the same support given to national treasures Paul Gascoigne and Frank Bruno. WBC cruiserweight champion Tony Bellew came out in support of his pal Fury as he called on the public to give the troubled fighter help. Fury is set to be stripped of his WBO and WBA titles after allegedly failing a Voluntary Anti-Doping Association test for cocaine. He withdrew from his scheduled rematch with Wladimir Klitschko TWICE with the second pull out down to mental illness.Fury has since said in an interview with Rolling Stone he has used cocaine and is battling depression. His team remain unavailable for comment on the matter.Bellew stressed Fury deserves to be banned if the VADA test is proved to be 100 per cent correct and that he does not agree with all of the Manchester-born fighter’s views. 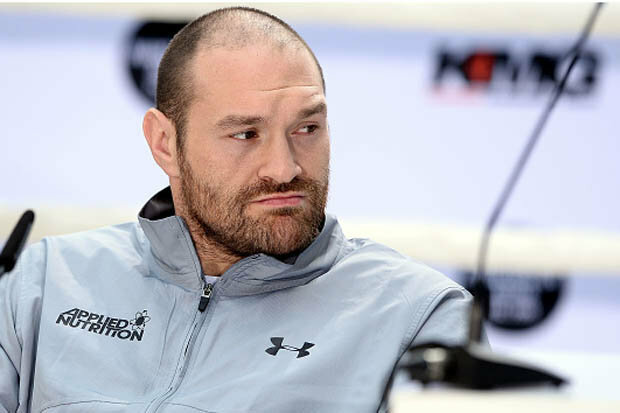 But the Liverpool fighter – who knows the Fury family – is concerned for the WBO and WBA heavyweight champion and he believes he is mentally unstable. Former England midfielder Gascoigne has been battling alcohol addictions for years and British boxing icon Bruno has bipolar disorder. Bellew said: “It is so sad, it is breaking my heart. “Social media is life, so when someone like Fury takes to the phone on social media and is having a bad day it is entertainment for people. “They are seeing past the fact that this man is mentally sick. It is very much like Paul Gascoigne and what happened with him.“People are taking pictures of him (Gascoigne) when he is half naked in the street or whatever and people are laughing at him.“But when you look really inside of the man he is mentally ill and that is not to be laughed at. Tyson Fury is in the same boat. “So treat him with the same affection that the country treats Paul Gascoigne with. “You have a great sportsman there who has done a great thing in beating Wladimir Klitschko, but is mentally unwell. Bellew has got to know Fury, his father John and uncle and trainer Peter so is close to the family.Like Billy Joe Saunders, who is also a friend of the heavyweight, he fears he could take his life without boxing.“I have spent time around him,” Bellew said. “I know him and he is the kind of person who needs boxing. “I wouldn’t be shocked to open up a paper and to see he had dealt with the issue himself. That would be heartbreaking and very sad. “People have to remember he is a son to a mother and father, a husband to a wife and a father to young children. Those people need him. But Bellew is not ignoring the alleged failure of a VADA test for cocaine. He added: “If it is 100 per cent right he has failed a drugs test he is a disgrace, he is an idiot for taking cocaine. But don’t shun his mental illness. “I am not condoning what he has done, if he has done it he needs banning.“But I’m not putting him in the bracket with the steroid cheats.“Recreational drugs are one thing, but taking performance-enhancing drugs before a fight is a disgrace and you need banning for life for that. Matchroom chief Eddie Hearn is hoping Fury can make a full recovery and is cleared to return to the sport. But he feels the heavyweight titles have to be freed up until Fury can return as he nears a deal for IBF champion Anthony Joshua to face Wladimir Klitschko. Hearn is confident at least one of the WBA or WBO will sanction that bout as a unification if Fury is stripped as he revealed the fight is edging closer with November 26 or December 10 the likely date. He said: “If I was asked now who Anthony Joshua will fight on November 26 or December 10, I would say Wladimir Klitschko. “The clear favourite is Klitschko but is it done yet? No.“I wouldn’t say we have an agreement, but perhaps you could say we have an agreement in principle.“Now it is all the other, probably two dozen, contractual problems to overcome.